There are many penetrating concrete sealers on the market that are excellent at repelling water, deicing fluids, road salts, and preventing freeze thaw damage. However, imagine your surprise the first time you try cleaning oil up from your garage floor or driveway and you are left with a stain? 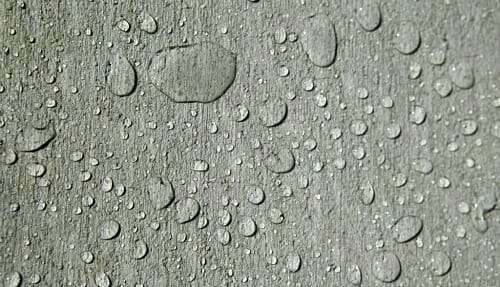 It is for this reason that GhostShield has introduced their new Siloxa-Tek 8505 and 8510 oil repelling concrete sealers. There are two categories of garage floor sealers to choose from – penetrating sealers and film forming sealers. As well as penetrating concrete sealers work at protecting your garage floor and driveway from the elements, they are less than perfect from protecting your concrete from oil stains. 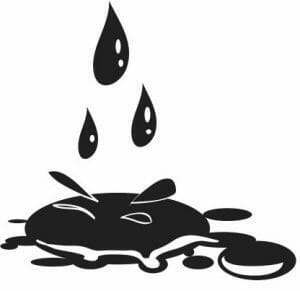 If oil or other petroleum products from a leaky vehicle is allowed to sit for a while, chances are it will leave a light stain on your concrete after you clean it up. There is a reason for this. Unlike film forming sealers that create a visible topical coating, think garage floor epoxy for example, penetrating sealers work by soaking into the concrete and creating a chemical reaction that forms a molecular barrier at the subsurface. Water and chemicals have a difficult time getting pass this barrier, thus protecting the concrete from the elements. These sealers are very popular due to the fact that they don’t change the look of the concrete, they are relatively low cost, easy to apply, and they will not change the existing slip resistance of the bare concrete. When water eventually evaporates from the surface, is leaves behind the dirt, salts, and/or other residues that was carried by the water. These residues are generally easy to wash off the surface. Oil, on the other hand, does not evaporate. If left for very long on sealed concrete, it can leave a residue on the surface that has the ability to stain. Up until now, siliconate penetrating sealers have been the best at reducing the chances of oil stains on concrete, but they are not designed as an oil repelling sealer. Due to the increasing demands for concrete sealers that can resist oil staining, companies are now working to formulate sealers that do a good job of repelling oils. Siloxa-Tek 8505 and 8510 by GhostShield is one such product that is leading this field. 8505 is water-based while 8510 is solvent based. They have been formulated particularly for use on garage floors and driveways. Their unique blend of siloxane uses nanotechnology and fluorocarbons to create an oleophobic molecular barrier at the subsurface of concrete that repels oils in order to resist staining. Fluorocarbons have non-stick and friction reducing properties which when used in a sealer, causes oil film to be repelled or not attracted. It is similar molecular technology that is used for non-stick cookware and friction reducing parts in the automotive industry. Besides repelling oil, Siloxa-Tek 8505 and 8510 protects your concrete similar to a siliconate sealer. It will protect your garage floor from mold and mildew, freeze/thaw damage, salt and chloride intrusion, reduce vapor transmission and efflorescence, and still remain breathable. Of the two, our recommendation is the solvent based 8510. The solvent carrier agent allows for a higher concentration of active ingredients for better protection and penetration of the concrete. Though Siloxa-Tek 8505 and 8510 can be applied as a stand-alone sealer, GhostShield recommends that a densifier be applied to the concrete first. Since the molecular structure of Siloxa-Tek 8505 and 8510 is so small, the densifier works by filling the larger, porous capillaries deeper within the concrete. The resulting chemical reaction not only creates a denser interior structure that helps to resist moisture, it also strengthens the concrete at the same time. The densifier will prevent Siloxa-Tek from penetrating too deep into the concrete. It allows the small nano molecular structure of Siloxa-Tek to fill the remaining voids and create a much denser, oil repellent barrier at the subsurface. If you were to apply GhostShield 8505 or 8510 without a densifier, the sealer can penetrate too deep into the concrete and require multiple, saturated coats in order to build up to the surface to be most effective. Applying it in this method would actually be more expensive. Only one application of the densifier is required. 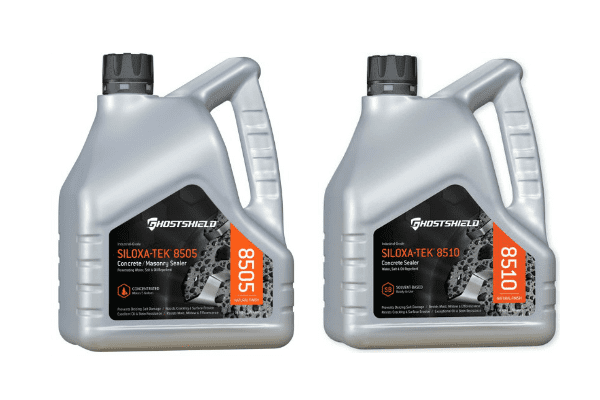 The GhostShield Siloxa-Tek 8505 and 8510 requires two applications. You can expect a coverage rate of approximately 250 ft² per gallon for a densifier. The GhostShield 8505 has coverage rate up to 250 ft² while the 8510 has a higher coverage rate up to 300 ft². In most cases, the only preparation is a thorough cleaning of the concrete beforehand. Application of the densifier and the Siloxa-Tek 8505 is easily done with a low pressure pump up garden sprayer. The solvent-based 8510, however, needs to be applied with a 3/8″ nap roller. You need to wait approximately 7 days after applying the densifier before applying the Siloxa-Tek. This wait period allows for the densifier to chemically react with the concrete to fill the larger voids. Applying the Siloxa-Tek beforehand will only reduce your coverage rates. It’s OK to walk and drive on the densified concrete within a few hours of application. We just recommend that you keep the garage floor clean and park your car on some old cardboard or mats to prevent oils from the vehicle tires from being deposited on the concrete before application of the Siloxa-Tek 8505 or 8510. Though GhostShield will not guarantee against stains, they are the only company to provide a 100 year warranty that the product will remain effective during that time. Having never seen such a long warranty for a product, we did a little digging to see what the warranty actually covers. What we found was actually not too surprising. GhostShield warranties Siloxa-Tek 8505 and 8510 Oil Repellent Sealers against flaking, chipping, fading, and delamination for 100 years under a host of conditions. One of those conditions is a reapplication once every 10 years. While the 100 year warranty does sound impressive, we find it a bit gimmicky since penetrating sealers will not flake, chip, or delaminate anyways since they penetrate into the concrete. Essentially, only a film forming sealer can actually do this. This doesn’t take away from the fact that it’s an excellent product, however, we just think that it can be a bit misleading for someone who doesn’t know much about how sealers work. We recommend purchasing from a vendor with concrete sealer experience. Garage Flooring LLC is one such vendor and has become an authorized dealer for GhostShield. They offer the best pricing we have found for GhostShield products which includes free shipping as well as great customer service. We recommend contacting them if you have any questions regarding quantity and application. Is an oil repelling sealer for you? Siloxa-Tek 8505 and 8510 are outstanding sealers that will provide the best protection of bare untreated concrete for a high duty garage floor or driveway. It will not change the look of the surface and it will retain the same slip resistant properties as bare untreated concrete. The 8505 was first released a little over 2 years ago and the 8510 was released about 1 year ago. Since then we have been receiving many reviews and comments from people who are extremely happy with their results so far. These reviews have ranged from people that just park their cars in the garage to those that rebuild tractors in their large shop. If you don’t relish the labor, concrete preparation, and cost for a quality garage floor coating, but worry about oil and other automotive fluids in your garage or driveway, then Siloxa-Tek 8505 or 8510 makes for an excellent choice. Additionally, it is an easy DIY application and has a 100 year warranty to back it up. However, if you want something that is stain proof, or you are one to let oil and other spills sit for long periods of time before cleaning them up, then you may need to reconsider a film forming coating for your garage floor instead. Thinking of sealing a shop floor with siloxa-tek 8505. Can I use ghostshield sila-tek 3500 as the densifier as the primer coat first? Yes, you sure can Clay. Thanks for an incredibly informative site! This looks like an ideal sealer for my new garage slab. What is your favorite densifier right now? I’ve been looking at colloidal silica based products like Lythic Densifier. I looked at the sila-tek 3500 mentioned above, but didn’t see what type of densifier it is. Hello Neal. We recommend lithium based densifiers for most DIY projects. It’s easier to apply, it does not require scrubbing-in, and it has much less of a tendency to create a whitening of the surface as sodium silicate densifiers. Thanks for you’re help! Since Siloxa-Tek 8505 is oleophobic, do you think it would it interfere with the adhesion of expansion joint sealers? That’s a good question Neal. We would think not since those type of sealers do not rely so much on penetration into the substrate. You could always seal the joints first then apply it. We would recommend contacting Ghostshield to be sure. We’ve always found them helpful on the phone. I just wanted to let you know how everything worked in the end in case you are interested. Ghoastshield did recommend putting down expansion joint sealer before applying Siloxa-Tek 8505. Since I might not be able to re-apply the joint sealer I needed something that would last so I went with Spal-Pro RS 65 polyurea joint sealer by Metzger. I applied this product followed by a densifier and then the Siloxa-Tek 8505 and everything seems to be working great! Thanks so much for your help! Thanks for the update Neal. We’re glad it’s working great for you! Has anyone used 8505 or solvent-based 8510 on polished concrete? The protection characteristics seem ideal, if it doesn’t white-out on the polished surface. Note: I contacted GhostSheild and they recommend 8510 (solvent-based) for polished concrete, but I feel a bit of a guinea pig since I havent found any examples of application. I may use Ameripolish SR2, but it has a much shorter (2 year) reapplication requirement. We wouldn’t recommend it DJ. What you need to use is a stain guard sealer for polished floors. These are formulated to penetrate into the very tight pores of polished concrete and provide a very thin protective film on top. They are then burnished with a high speed buffer in order to provide a glossy finish. Due to the solvent base, GhostShield 8510 penetrates better than 8505 and may provide some protection, but it does not provide a thin topical film. The bigger issue, however, is that polished concrete is not maintenance free. It requires the occasional rebuffing to keep the shine, especially for a garage floor (assuming this is your intention). The 8510 will not polish up well and may hinder any attempts to do so with another product afterwards. It may require re-polishing the surface with a fine grit stone to get the shine back. I built a concrete shower and am trying to decide how to finish it with a stain and sealer. What is your opinion on staining the concrete with an acrylic stain and then using Siloxa-Tek 8510 to seal it? I also noticed the article mentioned the densifier. Would I use the densifier first, stain second, and finish it off with two coats of Siloxa-Tek 8510? Hello Jason. The problem with using a penetrating sealer such as GhostShield on stained concrete is that it will not enhance the stain color at all. Concrete stain looks very dull and boring once it has been applied to concrete and allowed to dry. However, when it is “wet out” by a topical sealer, the stain color pops with vibrancy and deep colors. Penetrating sealers will not do this. When first applied, the wet stain will come to life, but once the sealer penetrates and dries, the concrete will return to the original stained look before the sealer was applied. If you are looking to achieve a solid stain color with a dull, matte finish then a penetrating sealer will achieve that. If you want the typical look of vibrant stained concrete, you may want to apply a topical acrylic sealer instead. An MMA gloss acrylic would be a good choice. Just had a new home built. Can I put on PS104 Lithium Silicate Densifying WB Penetrating Sealer w/ Siliconate Repellent first? Wait 7 days, then put on Siloxa-Tek 8505? This is for our garage. Hello Roland. You have the timing correct, but you need to use PS103 densifier and not PS104. The PS104 has siliconate sealer added which will block penetration of the Siloxa-Tek 8505. The PS103 is a straight densifier (which you want to use) without any added sealers. I have a bare garage concrete floor I want to seal it and be oil resistant….what do I need to start this project? Hello Hector. You just need to clean your concrete, make sure you don’t have a sealer on it already, and then apply the product as we discuss in the article. That’s all there really is to it. It look like fraud need reapplication once every 10 years that mean seal can not protect floor after 10 year need reapplication once to keep protect it. No, it’s not fraud, David. However, we did point out that it is deceptive because you are led to believe (until you read the fine print) that you will be warrantied for 100 years without having to doing anything afterwards. We also pointed out that penetrating sealers cannot peel, fade, delaminate, or chip either since they go into the surface of concrete. Only a topical sealer (coating) can chip, fade, peel, or delaminate. Regardless, it’s still an excellent product. OK, I have a problem with moisture/condensation during weather changes, Efflorescence (dusty) , AND I have old junk that sits around and drips oil all day. My MAIN concern is the moister and the dust, I can stand with a few oil stains…. would this product cover me on all three, or should I go with a siliconet penetrating sealer? Hello Bud. If you apply it as recommended you should be good. The most important product to put down for the moisture and dusting would be the densifier. So as long as you do that first followed a week later by the GhostShield, you will have oil stain resistance as well. Hi Richard. If you have a penetrating sealer on the driveway currently, you can apply the GhostShield 8510 over it without the densifier. Great article. I was originally focused on an epoxy treatment for our old garage floor but the densifier/siliconate sealer combination is far superior for our purposes. My issue is I have a number of cracks in the concrete showing efflorescence. I understand I can remove this with muriatic acid but will this affect the application of densifier/siliconate sealer? Also what would be the best product to fix the cracks in conjunction with the Ghostshield products mentioned (Silica-Tek 8510 and PS103)? Remove the efflorescence with a milder acid etch, Duncan, and you will be fine. Use a ratio of 6-7 parts water to 1 part acid. Scrub the solution over the affected areas with a stiff nylon brush, neutralize, then rinse real well. We have an article on crack repair here. We have a list of products there that work well. Repairs look best if you lightly grind them flush afterwards. Thank you Shea. But would you not recommend a concrete based repair? Like the Quikrete Concrete Patching Compound or something similar? Maybe more of a slurry? I ask this because since I will be using a penetrating sealer and not an epoxy I want the sealer to also be able to penetrate the repaired cracks. And if I’ve repaired them with an epoxy or polyurethane or polyurea compound I don’t think the ghostshield sealer and densifier would penetrate. Thoughts? I don’t think I explained this as well as I could have, Duncan. Epoxy and polyurea crack repair products are not only stronger than the surrounding concrete, they actually seal the crack as well. Very well in fact. They are non-breathable and physically block any and all penetration of liquid and air – just as an epoxy or polyurea coating of the entire floor would. They are a better sealer than any penetrating concrete sealer treatment ever could be. As a result, they will block any penetration sealer treatment at the repair, but it doesn’t matter since they are sealing the crack better anyways. In short, repairing your cracks with an epoxy or polyurea product and then applying a sealer treatment is the best course of action. Just make sure to lightly wipe up any of the sealer that has collected on top of the crack repairs (they will not penetrate) after the surrounding cement has begun to absorb the treatments. If you don’t, they will leave a white residue that needs aggressive scrubbing to remove. Polymer-modified cement products, on the other hand, do not work as well for most crack repairs. This is due to the thin nature of cracks. They work better for repairing large holes, chunks, and spalling. They are also used as overlays. Additionally, penetrating sealers and densifiers do not work well on polymer-modified cement. The reason is that these type of sealers react with the different minerals in concrete to form a sealing barrier. Polymer-modified cements lack many of these minerals due to the use of polymers. The polymers are what help to provide much better bonding to cement (as well as strength) versus a standard cement product, which always crack and break away. Because the sealers do not react as much, they do not seal very well. Great information Shea, thank you for going more in-depth, I’ll let you know how it goes!